When it comes to Viking’s fashion and clothing choices they had a style all of their own, suited to their climate and location. Warm and comfortable was the key factor, with their typically farming based lifestyle, the viking clothing also needed to be hardy and keep them warm while outside working. While functional in design, the Vikings were also fans of design, and jewerly and adornments. Metal jewerely bracelets, brooches and other items were worn by most Vikings. Clothing was often decorated with embroidery and braids, these kind of details were often added to the edge of clothing items, and were seem not only in clothing designs but all aspects of the Vikings world. Your status in Viking society would also be indicated with your clothing. Only the finest clothes were worn by high status Vikings, like the very fancy, detailed and intricate mantles that were reserved for Kings or the nobles like the Jarls. 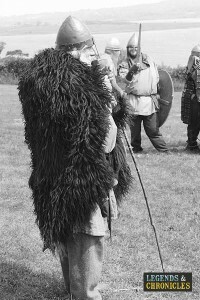 A Viking man wearing a animal fur cloak. Leather was commonly created from animal hide and used to produce a multitude of clothing accessories, like belts, boots and shoes, and many other items. Metal was used for many items also, belt buckles, pins and of course brooches to hold their cloaks in place. Animal bone was also used for some items, including pins and to even make haircombs. 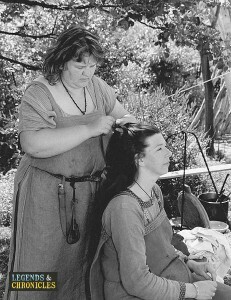 Its true the Vikings while considered wild were actually quite fastidious groomers. Jewelry was popular in Viking times, and we go into much more detail about it in our specific article. But to touch on it quickly as part of a Vikings clothing they wore lots of jewelry and in Viking time it was often a nice sign of stature too. Brooches were as we already mentioned common and nicely detailed, rings and metal arms bands were popular too. A shirt or tunic made of wool or linen was worn on their torso, depending on the season. This would often go below their waist and would be fastened and kept in position using a leather belt on which they may also attach pouches, knives or other small belongings. Viking men typically wore trousers either made of wool or linen. The woolen trousers were typically worn in winter and in summer, the trousers made of linen would have been worn in summer. Hats were common also, and the Vikings had many different hat styles to choose from. Over the top of their basic clothing the Viking men would sport a woolen cloak fastened by a brooch. The cloak was a useful item of clothing, in the winter it would be used to keep them warm and on their travels overseas the cloak would serve as a blanket or cover should they need to sleep while on a boat or camping. If you were a very rich Viking man, then instead of wearing a woolen cloak, you might have had what the English refered to as a mantle. This was a very expensive and finely crafted cloak, finished with fur trimming and highly detailed embroidery on all the edges. The Mantle was a way for a Viking man to show his status immediately and these items were hightly desired by foreign men also. Viking women wearing summer linen clothing. Viking women would dress slightly differently to their male counterparts. Dresses were common and in winter they would wear a close-fitting, long wollen gown that would hang to the ankles without a belt. In the summer they would wear a much lighter linen dress, which was much more suitable especially when the weather in Scandanavia became warmer. Overdresses were common also, or even aprons to protect their clothing while performing farming or cooking tasks. On their feet Viking women would wear leather shoes over woolen leggings or stockings. Headwear was common too, and in particular a simple head scarf, hood or wimple made of linen seemed to be common, especially amongst the later Viking women. If the women did wear a wimple then it was sometimes fastened with a woven band or with pins made of bone. What did Viking children wear? Well viking children actually wore exactly the same as their parents, but of course they wore slightly smaller versions of the same clothing. Viking boys would dress like their fathers, and little Viking girls similary dressed like their mothers. Clothing quickly changeable for all seasons and traditionally cold weather was needed to survive in Viking times. These people wore simple clothing for the most part, detailed with jewerelly and accessories. Men, women and children all wore very similar style clothing and only the very wealthy or high status citizens were afforded the rare luxury clothing items of the Vikings.